MILAN – The global economy is settling into a slow-growth rut, steered there by policymakers’ inability or unwillingness to address major impediments at a global level. Indeed, even the current anemic pace of growth is probably unsustainable. The question is whether an honest assessment of the impediments to economic performance worldwide will spur policymakers into action. Since 2008, real (inflation-adjusted) cumulative growth in the developed economies has amounted to a mere 5-6%. While China’s GDP has risen by about 70%, making it the largest contributor to global growth, this was aided substantially by debt-fueled investment. And, indeed, as that stimulus wanes, the impact of inadequate advanced-country demand on Chinese growth is becoming increasingly apparent. Growth is being undermined from all sides. Leverage is increasing, with some $57 trillion having piled up worldwide since the global financial crisis began. And that leverage – much of it the result of monetary expansion in most of the world’s advanced economies – is not even serving the goal of boosting long-term aggregate demand. After all, accommodative monetary policies can, at best, merely buy time for more durable sources of demand to emerge. Moreover, a protracted period of low interest rates has pushed up asset prices, causing them to diverge from underlying economic performance. But while interest rates are likely to remain low, their impact on asset prices probably will not persist. As a result, returns on assets are likely to decline compared to the recent past; with prices already widely believed to be in bubble territory, a downward correction seems likely. Whatever positive impact wealth effects have had on consumption and deleveraging cannot be expected to continue. The world also faces a serious investment problem, which the low cost of capital has done virtually nothing to overcome. Public-sector investment is now below the level needed to sustain robust growth, owing to its insufficient contribution to aggregate demand and productivity gains. The most likely explanation for this public investment shortfall is fiscal constraints. And, indeed, debt and unfunded non-debt liabilities increasingly weigh down public-sector balance sheets and pension funds, eroding the foundations of resilient, sustainable growth. But if the best way to reduce sovereign over-indebtedness is to achieve higher nominal GDP growth (the combination of real growth and inflation), cutting investment – a key ingredient in a pro-growth-strategy – is not a sound approach. Instead, budget rules should segregate public investment, thereby facilitating a differential response in fiscal consolidation. Increased public-sector investment could help to spur private-sector investment, which is also severely depressed. In the United States, investment barely exceeds pre-crisis levels, even though GDP has risen by 10%. And the US is not alone. Clearly, deficient aggregate demand has played a role by reducing the incentive to expand capacity. In some economies, structural rigidities adversely affect investment incentives and returns. Similarly, regulatory opacity – and, more broadly, uncertainty about the direction of economic policy – has discouraged investment. And certain types of shareholder activism have bred short-termism on the part of firms. There is also an intermediation problem. Large pools of savings in sovereign wealth funds, pension funds, and insurance companies could be used, for example, to meet emerging economies’ huge financing needs for infrastructure and urbanization. But the channels for such investment – which could go a long way toward boosting global growth – are clogged. Meanwhile, technological and market forces have contributed to job polarization, with the middle-income bracket gradually deteriorating. Automation, for example, seems to have spurred an unexpectedly rapid decline in routine white- and blue-collar jobs. This has resulted in stagnating median incomes and rising income inequality, both of which constrain the private-consumption component of aggregate demand. Even the one factor that has effectively increased disposable incomes and augmented demand – sharply declining commodity prices, particularly for fossil fuels – is ultimately problematic. Indeed, for commodity-exporting countries, the fall in prices is generating fiscal and economic headwinds of varying intensity. Inflation – or the lack of it – presents further challenges. Price growth is well below targets and declining in many countries. If this turns to full-blown deflation, accompanied by uncontrolled rising real interest rates, the risk to growth would be serious. Even very low inflation hampers countries’ ability to address over-indebtedness. And there is little sign of inflationary pressure, even in the US, which is near “full” employment. Given such large demand shortfalls and output gaps, it should surprise no one that even exceptionally generous monetary conditions have proved insufficient to bolster inflation. With few options for fighting deflation, countries have resorted to competitive devaluations. But this is not an effective strategy for capturing a larger share of tradable global demand if everyone is doing it. And targeting exchange-rate competitiveness doesn’t address the aggregate demand problem. If the global economy remains on its current trajectory, a period of intense volatility could destabilize a number of emerging economies, while undermining development efforts worldwide. That’s why policymakers must act now. For starters, governments must recognize that central banks, however well they have served their economies, cannot go it alone. Complementary reforms are needed to maintain and improve the transmission channels of monetary policy and avoid adverse side effects. In several countries – such as France, Italy, and Spain – reforms designed to increase structural flexibility are also crucial. Furthermore, impediments to higher and more efficient public- and private-sector investment must be removed. And governments must implement measures to redistribute income, improve the provision of basic services, and equip the labor force to take advantage of ongoing shifts in the economic structure. Generating the political will to get even some of this done will be no easy feat. But an honest look at the sorry state – and unpromising trajectory – of the global economy will, one hopes, help policymakers do what’s needed. Copper prices have crashed to their lowest level since the Lehman Brothers crisis and industrial metals have slumped across the board as a flood of supply overwhelms the market. The violent sell-off came as the US dollar surged to a 12-year high on expectations of an interest rate rise by the US Federal Reserve next month. The closely-watched dollar index rose to within a whisker of 100, and has itself become a key force pushing down commodities on the derivatives markets. Copper prices fell below $4,500 a tonne on the London Metal Exchange for the first time since May 2009, hit by rising inventories in China and warnings from brokers in Shanghai. Prices have fallen 32pc this year, and 55pc from their peak in 2011 when China’s housing boom was on fire. Known to traders as Dr Copper, the metal is tracked as a barometer of health for the world economy but has increasingly become a rogue indicator. China consumes 45pc of the world’s supply, distorting the picture. Beijing is deliberately winding down its "old economy" of heavy industry and break-neck construction, switching to a new growth model that is less commodity-intensive. The CPB index in the Netherlands shows that global trade began to recover four months ago after contracting earlier in the year, and the JP Morgan global PMI index for manufacturing has risen since then to 51.3 – well above the boom-bust line. The trigger for the latest plunge in copper prices was a decision last week by the Chilean group Codelco to slash its premium for Chinese customers by 26pc, effectively launchng a price war for global market share. “We're trying to lower costs. We’re not cutting production,” said the group’s chief executive, Nelson Pizarro. Glencore has already said it will suspend output in Zambia and the Congo for two years until new equipment is installed, and others are doing likewise. But Codelco is the key player. Kevin Norrish, at Barclays Capital, said Codelco is in effect copying Saudi Arabia’s tactics in the oil market: using its position as the copper industry’s low-cost giant with a 10pc global share to flush out the weakest rivals. The price war comes as the expected revival of Chinese metal demand disappoints yet again. Warehouse stocks in Shanghai have risen to their highest in five years, though LME inventories have been falling since September. Views are starkly divided over the outlook for copper, as it is for the whole nexus of commodities. Goldman Sachs says the demise of China’s "old economy" will lead to a near permanent glut through to the end of the decade. Natasha Kaneva, from JP Morgan, said it would take another one to two years to touch the bottom of the mining cycle, predicting further price falls of 12pc-28pc. "We remain bearish on all the base metals," she said. But the International Copper Study Group is sticking to its guns, insisting that there will be a global copper shortage of 130,000 tonnes next year. What is clear is that the commodity rout has taken on a life of its own, with financial flows and speculators reinforcing the crash. Nickel, lead, zinc and aluminium have all plunged over recent weeks, tracking the parallel drama in oil and gas. Even soybeans and wheat have fallen by roughly 40pc since May. Commodity crashes are a dangerous warning signal if global demand is falling. But they are benign if caused by excess supply, acting as a shot of stimulus for most of the world, or a “positive supply shock”, as it is known. Peter Praet, the European Central Bank’s chief economist, said the jury is out on this point, warning that a “significant part” of the latest slump appears to come from weak demand and therefore needs watching carefully. Yet the current circumstances are nothing like mid-2008 before the Lehman crisis, when most commodities were reaching fresh highs even though the money supply was already buckling in the US, Britain and the eurozone. Some economists argue that it was the oil shock of June and July 2008 that ultimately caused the financial crisis three months later. This time the picture is inverted, with global real M1 money growing at the fastest pace in 30 years, potentially setting off a strong economic recovery. Harvard economist Carmen Reinhart said commodity busts typically run for seven years as it takes time to clear the tidal wave of supply from over-investment during the boom. If the historical pattern holds, we are only half-way through. “This commodity-price roller-coaster ride is probably not over yet,” she said. - Economic theory supporting globalization suggests that regional or national specialization towards producing goods that best suit those economies will benefit everyone as we all produce goods we are best at. - In reality, the current trend of globalization is leading to a global consumer demand crisis, in part because developed world consumers are earning less, while developing world consumers save more. - Implication for investors is that we need to re-think the diversified portfolio, because the broader market will be stagnated. Sector picking at right time is the ideal new strategy. In my last article dedicated to economic theories breaking down, I covered productivity and its relation to technological advances. I pointed out that not all technological innovations should be seen as improving productivity in the broader economy and producing more wealth. It is a highly controversial issue, which inevitably leads to charges of Luddite attitudes. For this article I want to cover globalization and how it fails to live up to its promise as indicated that it should, according to basic economic theory. In order to do that we should first establish what economic theory suggests should happen when global trade growth is facilitated. The theoretical basis for supporting globalization and the liberalization of trade is the assumption that different countries have different possibilities to produce certain goods based on their labor force, labor costs, and the environment they live in. For instance, the classical example is watermelon growing in Mexico, versus Canada. Goes without saying that Mexico is better suited for it thanks to its climate as well as lower labor costs. Canada on the other hand is considered to have a much better educated labor force, therefore it is seen as being better at producing innovative products such as software and so on. It is therefore seen as beneficial for both countries to trade with each other, with Canadians benefiting from tastier watermelon which they can get year round thanks to trade with Southern states such as Mexico, while Canadian labor is much better utilized in producing things such as software which they can export to countries where labor profiles do not permit for the same quality to be produced. Thus everyone benefits from better quality at better prices and everyone can specialize on producing the things they are best at producing. Theory works fine on paper and to some extent it may be true that the growth in global trade we have seen in past decades helped improve the lives of hundreds of millions of people initially. By initially, I mean in the initial few decades. But the trend is now breaking down and the negative consequences are actually creating a drag, which threatens to reverse some of the initial gains. As it turns out, in real life the theory brings with it some consequences when put into practice. As I pointed out to be the case with innovation, where I argued that certain innovations which lead to job loss, in fact lead to a lack of productivity gains because it kills consumer demand, therefore few new production facilities are being built or renovated, there is a paradox developing in the case of global trade as well. Globalization and the flow of trade that developed in past decades is now leading to a decline in global trade growth rates and is helping cause slower global economic growth. As we can see from the graph, global trade in fact entered its biggest decline in the past year or so since 2010, despite the fact that we are in what passes as an economic recovery these days. The WTO is predicting a sharp rebound, but it is hard to see where and how that rebound will happen. The initial effect of increased global economic integration through trade was indeed what everyone would have expected. 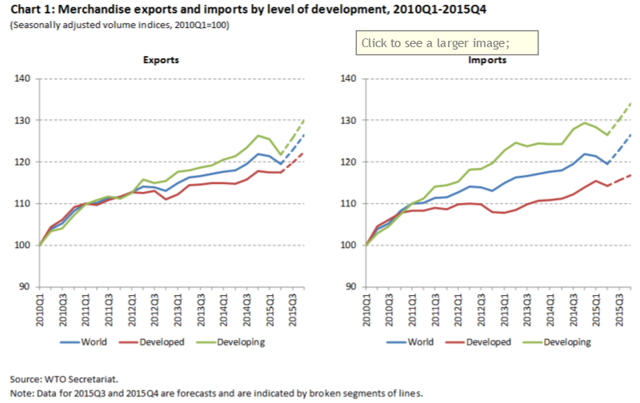 In the 1990's and up until 2007 global trade increased at twice the rate of global economic growth, while economic growth itself was also very healthy. Since then however, the WTO indicated that global trade growth has been more or less same as global economic growth, while growth as we know has been rather anemic, under 3% per year on average since 2008. There is one main factor related to globalization, which is leading to a global economic slowdown and paradoxically to a slowdown in trade growth as well. That factor has to do with the resulting decline in real incomes in the Western World, where the strongest consumers are to be found. As we can see, US household income has taken a decisively downward path since 1999 and it is not an insignificant trend given that real income is down almost 8% since then, as of the end of 2014. There are a few causes of the failure to improve US household incomes, one of which I indicated in my last article dedicated to economic theory failures. But one of the main trade-related causes has been the loss of manufacturing and increasingly higher-value jobs such as software development to the developing world. If we look at manufacturing alone since the WTO was established, the trend and correlation is unmistakable. The WTO was established in 1995 and just four years later manufacturing jobs started to disappear, and if we look at the graph above, it also coincides with the peak and subsequent decline in real household incomes. Source: Bureau of Labor Statistics. Note: Data is in thousands. As we can see, manufacturing jobs which generally tend to pay alright have been disappearing in the past eighteen years or so at a very fast rate. Five million jobs were lost so far. Back in the 1990's when globalization was starting to pick up steam, we were told not to worry because new jobs, better jobs and cleaner jobs will replace the ones we will lose. Economic theory in fact suggests that it should have been the case. That did not turn out to be true as the data on household incomes tells us. As it turns out, higher levels of employment in fields such as the much-trumpeted R&D never happened, because the sector did not have the capacity to absorb and make up for the job losses suffered. There are currently 2.7 million jobs directly related to all R&D being performed in the US. This figure has been more or less constant, with no amount of variation which would be of great consequence to the overall US job market, given that there are over 120 million people with a full-time job in total. This was and still is a false narrative, which induces people into error when it comes to today's realities. Going back to the effect this has had on the global economy, it turns out that developing world consumers such as the Chinese are not the best consumers, therefore not great drivers of demand. The wage earning power transfer from the developed world to them has resulted in money being stranded in Chinese consumer and government savings accounts. 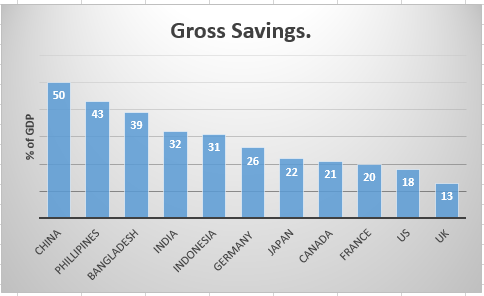 While the savings rate in most developed countries is somewhere between 10-25% of GDP, in the developing world it is in the 30-50% range. Some of the negative consequences of this trend were masked for a while by lower interest rates and higher rates of indebtedness in the developed world, which allowed for consumer demand to continue to increase, but on both fronts, we are looking at the end of those one-time measures. Lower interest rates and higher levels of indebtedness were incidentally made possible thanks to the effects of globalization, which includes lower inflation. Interest rates have nowhere left to go but up, while Western consumers and governments cannot continue to expand their liabilities for much longer. As was the case with the productivity assumptions, the assumption that globalization will provide for more prosperity for all in the longer run is looking to be less than a certainty to say the least. Looking ahead, the continued trend of globalization will continue to put downward pressure on global consumer demand, due in part to the higher savings rate. Ironically, this will lead to a slowdown in income growth in the developing world, which will make it harder for people living in those countries to satisfy their desires to save, because earning a decent income will become harder. In the developed world, the slow but steady march towards the global average income will continue. At some point government debt crises may speed up the process as we have seen in places like Greece already. There is more and more evidence that while countries such as India and China are converging upwards towards the global average GDP/capita, countries with a high level of income are converging downwards towards that same average. Because of the lack of robust global economic growth, which as I pointed out is in part due to the negative effects of globalization, we are set to all be disappointed in regards to where that average we are all converging towards will be found. As I pointed out in my first article on the issue of failures in economic theory when put into practice, slow global economic growth and a likely continued consumer demand crisis means that the diversified portfolio strategy will likely be a long-term failure. There are opportunities to play trends, where certain sectors may be due to move up for a while. Those are the opportunities that need to be explored and exploited. For instance, I am currently building a position in commodities, mostly in oil & gas companies based on the conviction that current prices are well below the minimum level of sustainability needed for the long term. Any investment strategy based on diversification meant to just slightly outperform the broader market will most likely leave investors disappointed with their longer term results. On Friday, the BDI closed at 498. It was the first time the index has closed below 500 in its twenty-year history. The BDI hit an all-time record high in May 2008. It’s been falling ever since. The index is now down 96% from that point. It’s plummeted an incredible 59% since August alone. Shipping rates soared from 2002 to 2008. The BDI rose more than 12-fold during this period. On Friday, Forbes reported that the global shipping industry still has 30% more capacity than it needs. Shipping giant A.P. Møller-Mærsk A/S (AMKAF) recently reported a 15% drop in sales during the third quarter. It was the fourth quarter in a row that sales dropped from the previous year. Mærsk is the world’s largest shipping company. It moves about 15% of all manufactured goods shipped worldwide. If Mærsk is struggling, it’s because global trade is slowing. Last month, the company also announced plans to lay off 4,000 workers. This will cut the company’s global workforce by 17%. Mærsk’s CEO, Nils Smedegaard Andersen, said he’s cutting jobs because the global economy is slowing faster than people think. We believe that global growth is slowing down...Trade is currently significantly weaker than it normally would be under the growth forecasts we see. Last month, the International Monetary Fund cut its global GDP forecast from 3.3% to 3.1%. The organization also lowered its growth forecast for 2016 from 3.8% to 3.6%. According to Andersen, these new projections are still too optimistic. Copper has been falling all year. Now it’s plummeting. Copper is down 14% in the past month alone. It’s now down 56% from its 2011 all-time high. Copper is used to make smartphones, televisions, laptops, and other electronics. It’s used in plumbing and roofing parts. Copper is also waterproof, so it’s used in shipbuilding. When the price of copper drops, it means a wide range of companies are making fewer products. In October, Caterpillar’s global machine sales fell 16% from the year before. It was the company’s biggest sales decline since February 2010. Caterpillar’s machine sales have now declined 35 months in a row. 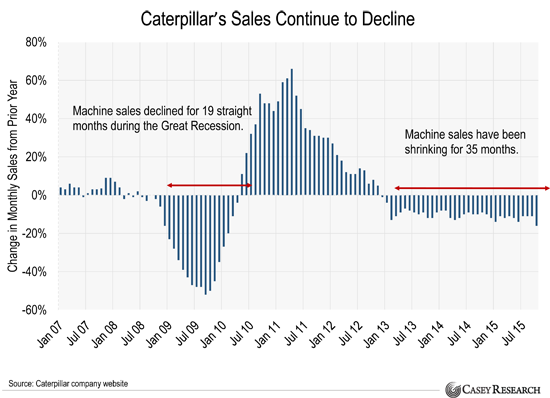 The chart below shows how Caterpillar is experiencing its longest streak of declining monthly sales since the Great Recession. Caterpillar is the world’s largest publicly traded equipment and machinery manufacturer. Its customers are the companies that build houses, office buildings, bridges, and the rest of the “real” economy. This is why many investors consider Caterpillar a “canary in the coalmine” for the global economy. Management expects annual revenues to drop 5% in 2016. If that happens, it will mark the fourth year in a row the company’s annual sales have dropped. That’s never happened in Caterpillar’s 90-year history. Europe is experiencing its weakest economic recovery in decades. During the second quarter, Europe’s economy grew half as fast as the U.S. economy. And at 10%, Europe’s unemployment rate is double the U.S. unemployment rate. The ECB has tried (and failed) to jumpstart Europe’s economy by cutting interest rates to zero. In March, the ECB went one step further and launched its first quantitative easing (QE) program. QE is when a central bank creates money from nothing and pumps it into the financial system. It’s basically another word for money printing. Every month, the ECB’s QE program pumps €60 billion ($65 billion) into the Eurozone’s financial system. It’s scheduled to run “at least until September 2016.” At that point, the program will have pumped at least €1.14 trillion into Europe’s financial system. Last week, the euro fell to a seven-month low against the U.S. dollar. The euro has now lost 20% against the U.S. dollar over the past two years. That’s a huge move for a major currency. When a central bank pumps money into a financial system, it increases the money supply. In short, QE increases the number of euros chasing the same number of goods and services, which weakens the euro. But more money printing won’t help Europe’s economy. That’s because the European Union has a serious design flaw. 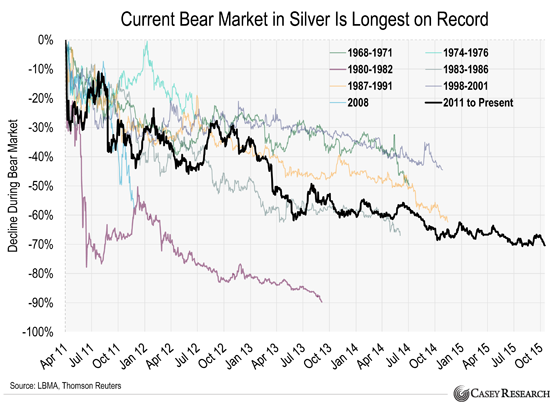 Today’s chart compares silver’s current bear market with previous silver bear markets. The price of silver hit an all-time high in April 2011. It’s been in a downtrend ever since. Silver’s current bear market has run 55 months so far. That makes it the longest silver bear market in five decades. The price of silver is now down 70% from its 2011 high. That’s the second-biggest price drop of any bear market since 1968. 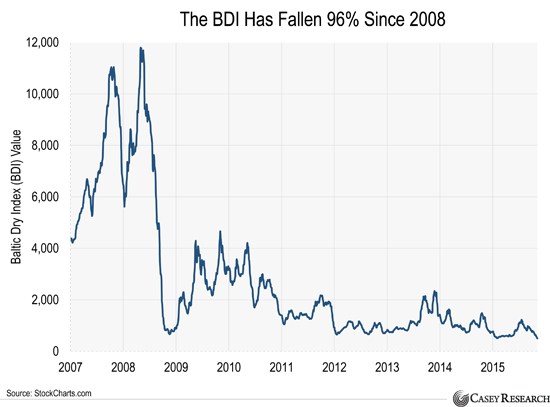 Like other commodities, the price of silver is highly cyclical. It goes through big booms and busts. And the turnaround could be explosive. Silver surged 441% during its 2008-2011 bull market. Louis James, editor of International Speculator, is very bullish on silver right now. He thinks a silver supply crunch could end this bear market. You can learn about Louis’ favorite silver company by taking International Speculator for a risk-free trial. Click here to learn more.